"Increase in number of incidents of theft after house break-ins, illegal use of electricity, manufacture and consumption of illegal liquor, violation of timber laws, and harrasment of young women in road junctions by youth gangs are causing fear among the public. Grama Sevaka officials and Governement officials should co-operate with the Police to help arrest this worrying trend," said Mr.Illancheliyan addressing the meeting. "Village level watchdog groups need to be established to help the law enforcement officials. Secretary of the district, GA, Police officials, District Court, Electrical Engineer in-charge of Electric distribution, Forestry officials and others will provide necessary support," added Mr.Illancheliyan. 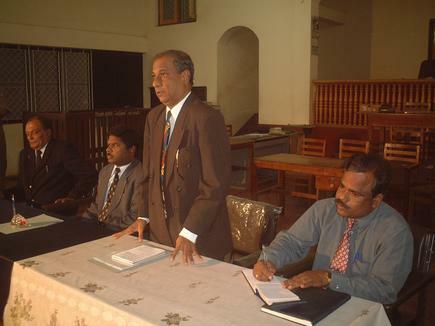 Mr.Ranjith Kasturiarachchi the Assistant Superintendent of Vavuniya, Mr.Ivon Gunaratne ASP of Cheddikulam and Mr.Wijenayake the Head Quarters Inspector of Vavuniya are seen at the meeting. Although population of Mannar district is 96,000 there are four police stations including those in Mannar, Murungan and TalaiMannar. But Vavuniya district with a population of 147,000 has only two police stations in Vavuniya town and in Chettikulam, the Judge pointed out. 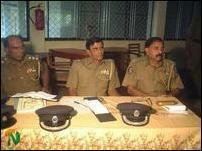 He urged the attending Police officials to take action to establish an additional Police Station in Vavuniya district. GA, Ganesh, Mr.Sittampalam, Assistant Superintendent of Police for Vavuniya, Mr. Ranjith Kasturiyarachchi and Vavuniya Urban Council Secretary V.S.Selvarajah also spoke. Vavuniya Inspector of Police (IP) Wijenayake, Chettikulam IP, Tissalal Silva, several other key officials of the Police Department, Government officials from Electricity Board, Educations Department and others participated in the meeting. 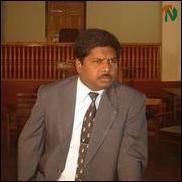 Mr.M.Sitrampalam the President of Bar Association, Vavuniya is addressing the meeting. Mr.K.Ganesh Government Agent is addressing the meeting. 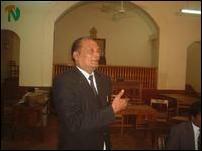 On his left is Mr.Sivalingam Sathiyaseelan the Divisional Secretary of Vavuniya.